I am the assistant Varsity Coach in the ward. Apparently they want to keep me in the young men's organization to add some high adventure to some of their activities. 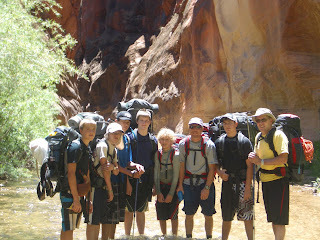 So........I suggested that we take the varsity scouts (age 14-15) through the Right Fork of North Creek in Zion for their summer high adventure activity. This would require traversing 18 miles of rugged terrain and a couple of rappels. However, when I went to get the backcountry permit from the rangers, I was informed, that you can now no longer have groups bigger than 6 in the backcountry of Zion. We were 9 counting the two other Dads in the group. I quickly came up with an alternative trip. We would canyoneer down Fat Man's Misery into Paranuep Canyon or the East Fork of the Virgin River. The trip started Thursday morning and we spent two nights in the East Fork drainage. After negotiating Fat Man's we then headed up stream until we came to Mineral Gulch. From there we preceeded up stream again in what turned out to be a beautiful slot canyon that lasted for 6 miles. Our exit was up another stunningly beautiful and remote canyon with a steep and rugged ramp to the rim. Our high adventure activity lasted 3 days and covered 20 miles of slot canyons, rivers, springs, slickrock, pinyon- juniper & ponderosa forests. We did not encounter any other persons the whole time and the weather was clear, hot and the night was brightly lit by a full moon. We all slept out under the stars with no tents. My buddy Eric came along and did remarkably well for an 11 year old "New scout".